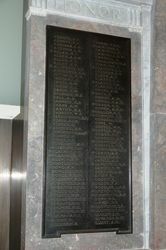 A marble and bronze honour roll commemorates members of the New South Wales legal profession who served in World War One. The planning for this Honour Roll began in July 1915, when the judges of the Supreme Court resolved there should be an official record of all the members and prospective members of the profession who enlisted for active service. It bears the names of all those who either were at the time of their enlistment, or became prior to 1 September 1921, members of the profession. The Honour Roll was rededicated on the 11th November 2002. 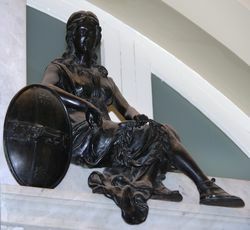 The elaborate marble and bronze memorial placed on the eastern wall of the vestíbule of the Supreme Court and containing the honour roll of members of the New South Wales legal profession who served in the great war, was formally unveiled by the Chief Justice (Sir William Cullen) in the presence of all the Judges and officials of the department yesterday afternoon. Owing to the limited space available there was not a full representation of the profession at this function, but immediately afterwards, in the Theatre Royal, the ceremony of formally handing the memorial over to the custody of the Chief Justice was largely attended by members of all branches of the legal profession. On the stage were the Chief Justice, all the Judges of the Supreme Court, the Prothonotary and Mr. D. W. Roxburgh, president of the Incorporated Law Institute of New South Wales. that, said his Honor, would embrace a good deal which could not be set out, except in a book, or similar record, and it involved the collection of a great deal of information relating to those who offered their services to their country. The work was undertaken by the then Prothonotary (Mr. Walsh) and his staff, but it was not yet complete. Although Mr. Walsh had retired, he had continued to act as secretary and treasurer of the memorial committee, and members of the profession owed Mr. Walsh a debt of gratitude for his untiring efforts. At the request of the committee Mr. R. S. Dodds offered to prepare a suitable design for the memorial, and an appropriate position on the walls of the building on which to place it, but unfortunately Mr. Dodds died. Mr. George McRae, Government architect, then came to the assistance of the committee. He submitted a design of which the committee approved and he selected the site on the wall beside the door of the library, and to the left of the main entrance door to the Supreme Court building in King-street. As soon as the design had been approved of, the committee invited contributions from the members of the profession, and nearly £900 was received from 417 contributors. Before the work was completed, however, Mr. McRae died, and Mr. Blair, the Acting Government Architect, undertook the work of supervising the carrying out of the contract. To Mr. Mann, director of the National Art Gallery, they were also deeply grateful for his interest and advice. The bravery of their soldiers, said Mr. Justice Street, was one of undying memory, and they would be an ungrateful people if they ever forgot their deeds. 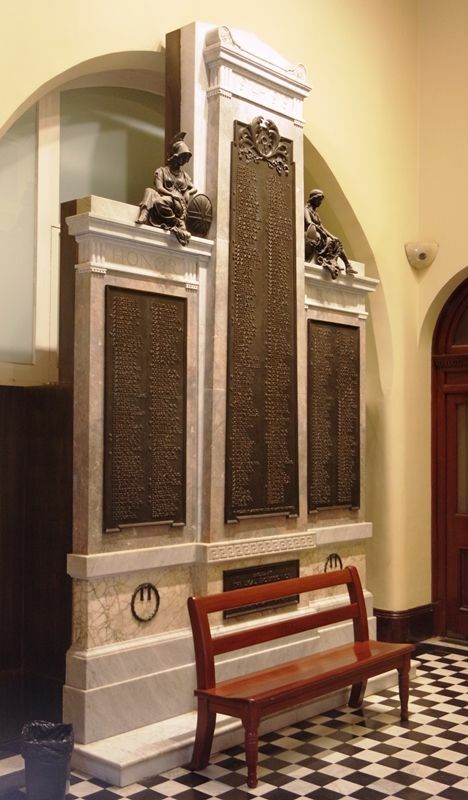 On this honour roll there were 363 names of men, of whom 65 made the supreme sacrifice. 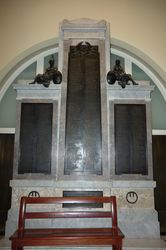 The tablet, which is in the Renaissance style, was designed in the Government Architect's Department, and is constructed of three kinds of marble-the base, panels, and top (which bears the words "Honour Roll" and the figures 1914-1919) being of Italian white marble; the portion bearing the dedication inscription, with a wreath on each side, of New South Wales (Cudgegong) ivory and gold marble; and the general body of the tablet of New South Wales King Edward grey marble. 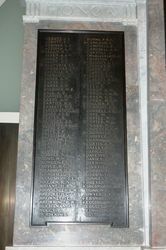 The plates containing the names of the members of the legal profession who enlisted and went to the war are constructed of bronze, and are three in number, and centre one being 9ft high and the side ones 4ft 6in. The names, which stand out in bas relief, and are highly polished, were cut out of solid bronze. 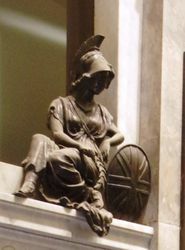 On the top of the smaller plates, and flanking the centre portion of the tablet, are seated two bronze figures, representing Britannia and Australia, each holding a memorial wreath. Sydney Morning Herald (NSW), 4 June 1924.